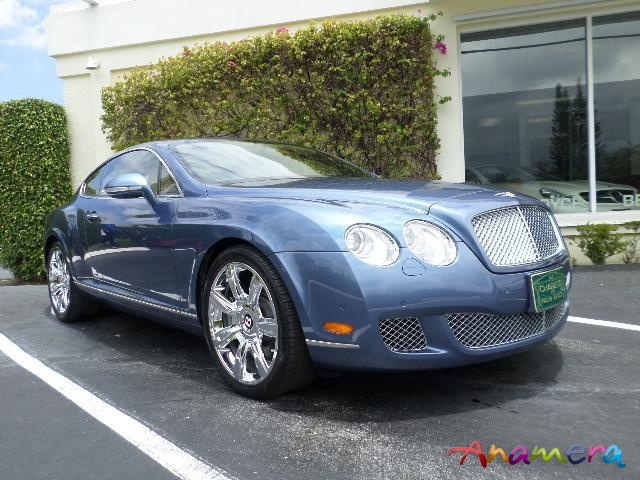 *** ONLY 7,900 MILES *** GT V12 COUPE! 20” FACTORY CHROME WHEELS! CONVENIENCE SPECIFICATION PKG! MASSAGE SEATS! CONTRASTING STITCHING! PRIVACY HANDSET! REARVIEW CAMERA! NAVIGATION! CARFAX CERTIFIED! Finished in Crystal Blue Metallic with Magnolia main hides and Imperial Blue secondary hides. Contrasting blue stitching throughout the entire car. Burr Walnut Wood Veneers. Headlining in Magnolia hides. Hide trimmed multi-function steering wheel with paddle shifters. 20” 7-Spoke Factory Chrome wheels. * Crystal Blue Metallic Exterior Paint. * 20” 7-Spoke Chromed Factory Alloy Sports Wheels. * Convenience Specification includes Bentley Personal Music Interface, Rearview Backup Camera, Massage Function to Front Seats and Cordless Privacy Handset for Telephone. * Bright Chrome Lower Bumper Matrix. * Contrasting Blue Interior Stitching. * Burr Walnut Wood Veneers. All the standard luxury features including Navigation System, remote keyless entry with keyless push start ignition. Auto-dimming mirrors with heated exterior mirrors, 14-way power heated front seats with lumbar support. Bi-Xenon headlights with high pressure washers and daytime running lights. Tire Pressure Monitoring System, variable intermittent rain sensing wipers and cruise control. All Books and 2 Keys. All Original. Non-Smoker. CARFAX Certified. Stunning! We are export specialists and proven experts in shipping vehicles worldwide. For additional details, reference letters, and to view our inventory of over 90 luxury certified vehicles, please go to www.chariotsofpb.com or please call us at 1-561-640-1090.